I made some mini brown sugar pavlovas recently, see here for my previous post. 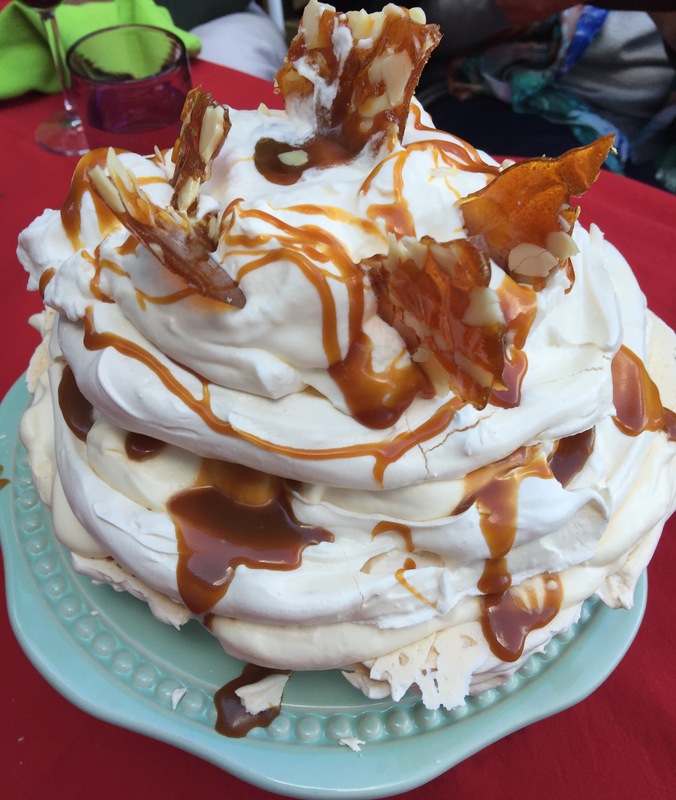 The brown sugar – in this case mixed with raw sugar – gives the pavlovas quite a caramel kick. They’re a little more flavourful than the usual pav. Preheat the oven to 200 degrees C. Draw 2 large circles (about 24cm) on baking paper on 2 baking trays. Pile the mixture onto the circles on the baking paper and spread into shape with a spatula. Place the baking trays in the oven and reduce the temperature immediately to 130 degrees C. Bake for 1 hour 20 minutes, then turn off the oven, prop the door ajar and leave the pavlova discs until completely cooled. Once cooled, carefully peel away the baking paper. Choose the best pavlova disc for the top. Put the other disc onto your serving platter, upside down so that the flat, baked side is uppermost. whip the cream with the vanilla paste. Spoon the whipped cream onto the bottom layer, then sandwich with the top layer. Crush some Malteasers and scatter randomly over the pavlova. Posted in Cakes, Dessert, Meringues, Sweet Food and tagged Malteasers, meringue, meringue layer cake, pavlova, vacherin. Bookmark the permalink. I’m a long time fan of Bill Granger and his food. His iconic first restaurant, bills in Darlinghurst, is a favourite place for breakfast or lunch – and it’s just around the corner from where I work. Bill is an Aussie who now has restaurants worldwide, which all reflect his ethos for food and dining. When you walk into bills in Darlinghurst, the vibe is friendly, warm and generous. No pretensions here! The communal table is great, allowing everyone to share in each others’ dining experiences as you observe the delicious dishes being served to fellow diners. There are some dishes that bills is famous for – creamy scrambled eggs, utterly moreish ricotta pancakes with banana and honeycomb butter and sweet corn fritters with roast tomato, spinach and bacon. These two latter dishes are breakfast through to lunch and I’ve had both at either end of the morning! Bills burgers are pretty good too, the wagyu burger, with grilled swiss, pickled green chilli, herb mayo, rocket and fries is one of the Darlo offerings. Another favourite on bills menus is the Aussie pavlova, and, as readers of other of my posts know, that’s a version of meringue of which I am very fond, possibly even obsessed… The Darlo bills version is a brown sugar pavlova, with rhubarb, pistachio and rosewater yoghurt. I ate this recently and had to go home and instantly recreate my own version, see my Brown Sugar Pav post here. The rest is in the photos. I’m regret I don’t have a photo of the scrambled eggs or wagyu burger – oh well, I will need to visit bills again soon I guess! Posted in Breakfast, Meringues, Reviews and tagged banana, Bill Granger, Darlinghurst, honecomb, hotcakes, pavlova, scrambled eggs, sweet corn fritters. Bookmark the permalink. I love any kind of meringue. 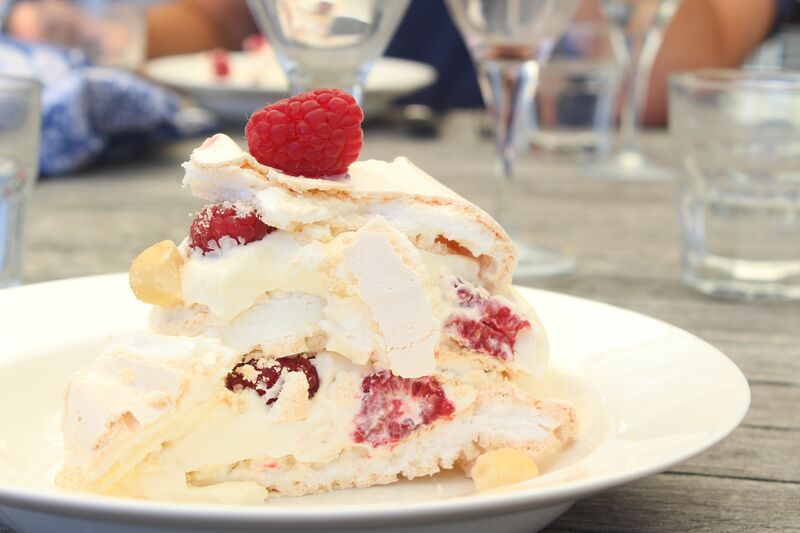 Pavlova, vacherin, lemon meringue pie or plain old little meringues which are bursts of sweet airiness. Little meringues are quick and easy to make. 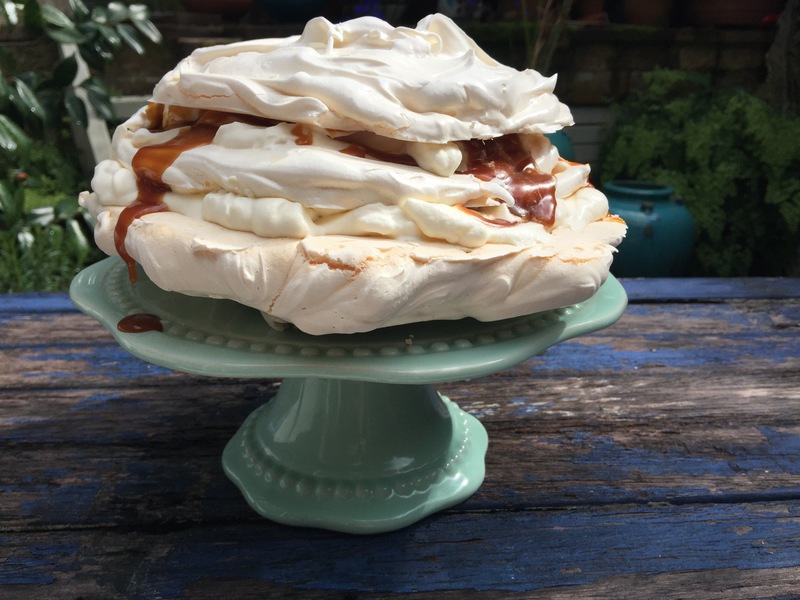 There are a myriad of things you can do with them – serve them on their own, make meringue sandwiches with a cream filling, flavour them, colour them, or pile them high into a meringue mountain which is my favourite thing to do. Here are a few meringue mountain ideas. Make meringues – flavour and colour of your choice – and pile up croquembouche style sandwiched together with vanilla cream. Here is my no fail meringue recipe, originally from Margaret Fulton, via an old recipe of my mother. Add your flavouring at this point or food colour. Spoon or pipe onto prepared trays. In the image below I made pink rosewater meringues as well as plain ones. Bake for 1 1/2 hours. Leave in oven for a further 1/2 hour or until dry – longer is better. When cool, store in an airtight container. I like my meringues free form – but you could certainly pipe them for a more formal effect! Assemble your meringue mountain in whatever way takes your fancy. I decorated the pink and white rosewater meringue mountain with crystallized rose petals. And this meringue mountain, using the basic recipe, is made up of sour cherry meringues and chocolate meringues. Posted in Dessert, Meringues, Small Baked Things, Sweet Food and tagged afternoon tea, Margaret Fulton, meringue mountain, pavlova. Bookmark the permalink. This is a great dessert which is relatively easy to make. If you can make meringue, toffee and crème pâtissière, you can create this rustic spectacular! I call it a pavlova stack, as the meringue layers are like mini pavlovas. The base of the dessert is 3 layers of pavlova/meringue. They are stacked on top of each other with a filling of crème légère and burnt salted caramel sauce. 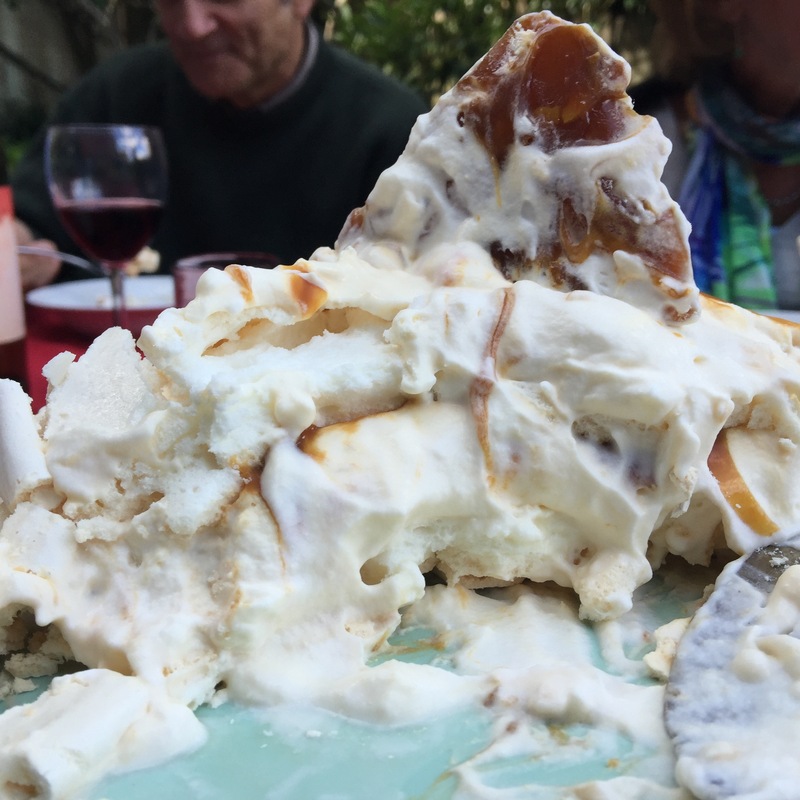 You can top the pavlova stack with almond praline shards. You could be very precise in making the cake – piping the meringue and piping the crème légère. Or go rustic and free form and just spoon everything on, smoothing out a few rough edges here and there. Here are the recipes for the component parts: pavlovas, crème légère, burnt salted caramel sauce and almond praline. Preheat oven to 120 degrees C, 100 Gas 1⁄2. Don’t cook these pavlovas on fan-forced setting. Place a sheet of baking paper on 2 baking trays. Draw a circle on one sheet, 20cm/8 inches in diameter. Turn the baking paper over so that you can see the pencil marking on the other side. Draw 2 smaller circles on the other sheet of baking paper, 15cm/6 inches and 13cm/5 inches in diameter. Turn the paper over so you can see the circle markings. You should be able to fit the 2 smaller circles on one baking sheet. Do not grease the baking paper! Beat egg whites with an electric mixer until stiff. Gradually beat in sugar, a teaspoon at a time, until very stiff. Stir in vanilla and vinegar. Spoon the mixture onto the 3 paper circles. You can “anchor” the baking paper down by putting a small dob of meringue under each corner of the paper. Place baking trays in the oven. Bake for 1.5 to 1.75 hours, depending on your oven. 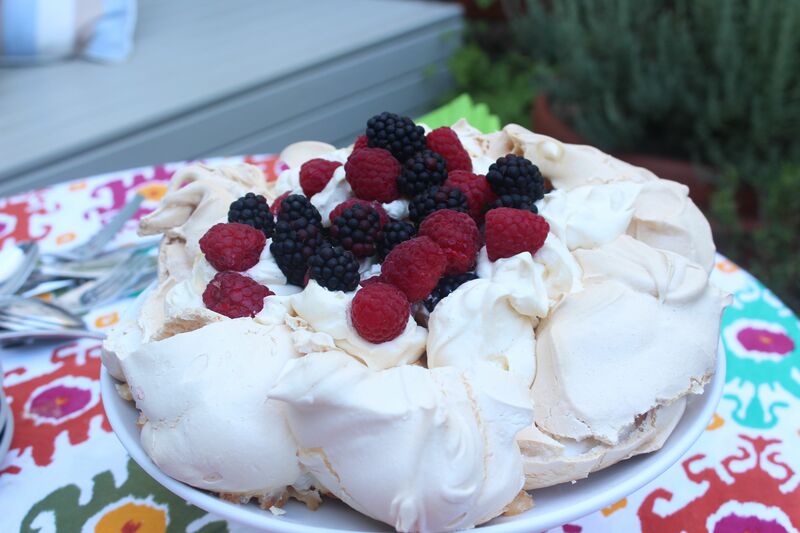 The pavlovas should be quite dry, but still white – if they are brown they have been cooked too long. Turn oven off, leave in oven a for further hour or you could leave until quite cold. Crème Légère – Crème légère is crème pâtissière combined with whipped cream. The result is a light, custardy cream great for filling puff pastry items like eclairs or for filling cake layers. Put the milk into a saucepan over a medium heat till just simmering. While the milk is heating, place egg yolks, cornflour, sugar and vanilla in a bowl, and whisk till combined and you have a smooth paste. Add half of the just simmered milk into the egg mixture and whisk this just to combine. Essentially, you are tempering the eggs, so that they don’t scramble by adding all the hot milk at once. Then add all this mixture back into the saucepan with the rest of the milk. Bring the mixture back to a simmer, whisking, or stirring with wooden spoon, until the the mixture has thickened considerably. Remove from the heat, stir in the butter and leave to cool. To make the creme légère to sandwich the pavlovas together, combine half the crème pat with 300mls whipped cream. The cream must be whipped past soft peaks stage until it is quite stiff – but be careful it doesn’t turn to butter! The idea is that the cream is stiff enough to incorporate the custard. Heat the sugar in a heavy bottomed saucepan over medium heat, stirring constantly with a rubber spatula or wooden spoon, until the sugar turns into a tea coloured liquid as you continue to stir. At this stage the toffee/caramel flavour is achieved. If you take the liquid to a slightly darker brown colour, you will achieve that “burnt’ flavour – but beware it is really easy to actually burn the caramel! Now add the butter very carefully – the caramel will bubble up. Stir the caramel until the butter is completely melted. Pour in the cream while continuing to stir. The mixture will bubble when cream is added. Allow the mixture to boil for about a minute. Remove from the heat and stir in the salt. Allow to cool before using. The caramel will thicken on cooling and thicken even more in the fridge. To ensure the caramel sauce is pour-able for the pavlovas, VERY carefully microwave to warm up on low heat. Or you could sit the container in a bowl of hot water to warm up. Pour onto a baking tray lined with baking paper. Quickly scatter over a handful of almond flakes. Leave to cool and harden. When completely cold, break up the praline into jagged shards. 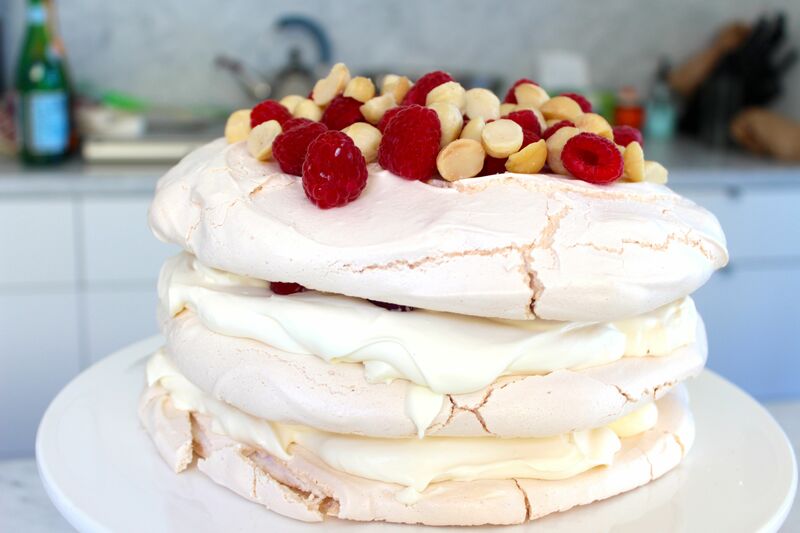 Place the largest pavlova on serving plate. It’s best to place with the bottom on the plate, and nice side up – I forgot with this layer and turned the pavlova layer the wrong way up. Smother with about half the crème légère. Drizzle or spoon over, according to taste, a couple of tablespoonfuls of the burnt salted caramel sauce. Place the middle sized pavlova on top as the next layer. Spoon about quarter of the crème légère over this layer, and drizzle or spoon a tablespoon – or more – of the caramel sauce. Put the remaining pavlova on top. At this stage you can refrigerate for a couple of hours until ready serve. 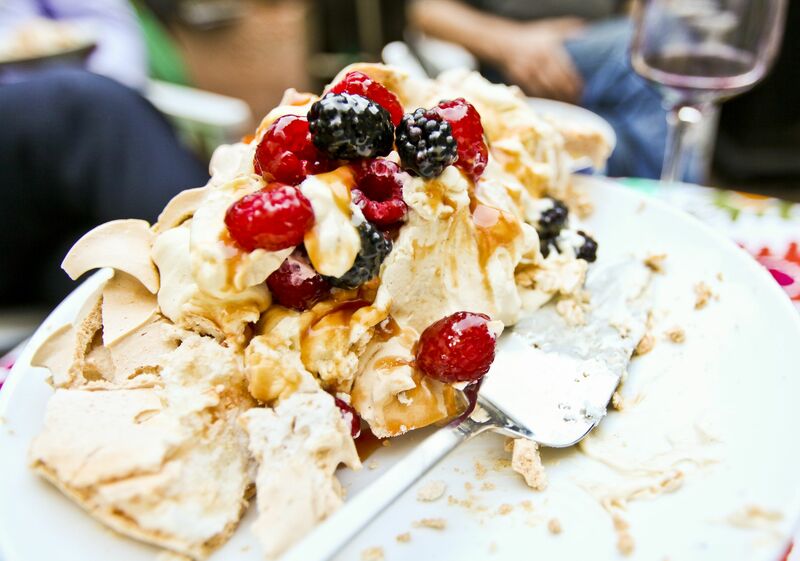 There is no reason for not serving the pavlova stack as is – see photo below. It looks pretty good! However, to make it utterly delicious and decadent, when you are ready to serve, pile on the remaining crème légère, drizzle with more caramel sauce and decorate with the almond praline shards. *Tip for cleaning the praline saucepan: fill the pan with water and heat on the stove top till just boiling. Turn off heat and leave for a few minutes – the hardened toffee should hopefully dissolve making the pan easy to clean. Posted in Cakes, Dessert, Meringues, Sweet Food and tagged almond, crème légère, crème pâtissière, meringue, meringue layer cake, pavlova, praline, salted caramel, vacherin, whipped cream. Bookmark the permalink. Today, on a beautiful Sydney day in beautiful Palm Beach, I was treated to this dessert. 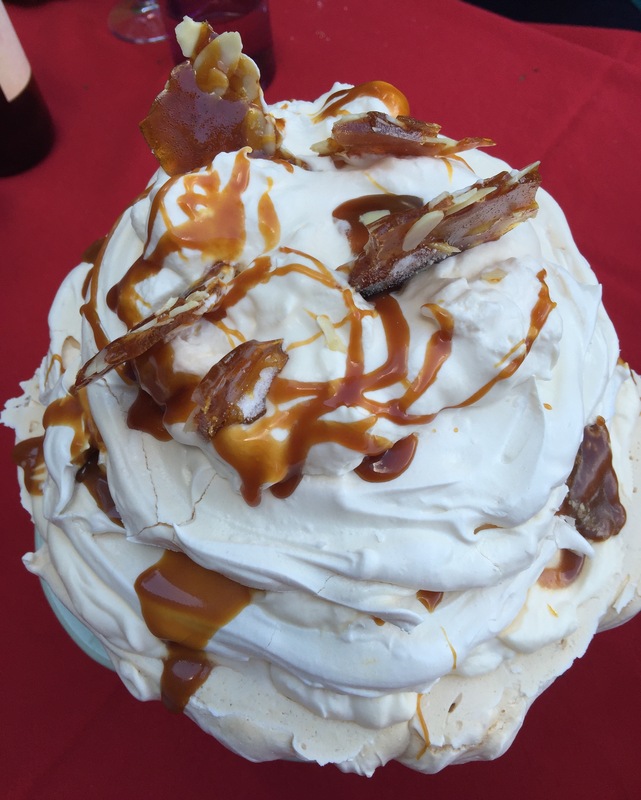 Maggie Beer, from whom the recipe emanates, calls it a meringue; I would describe it as a vacherin (layered meringue), but to all intents and purposes it’s a wonderful Australian pavlova – all three payers! Meringue + raspberries + creme fraiche and whipped cream + macadamias = Nirvana! Here is the link to the recipe and thank you to the Birthday Boy for providing the impetus for such a sensational end to the lunch! Posted in Dessert, Meringues, Sweet Food and tagged macadamias, Maggie Beer, meringue, Palm Beach, pavlova, raspberries, vacherin. Bookmark the permalink. I’ve made lots of pavlovas over the years, and this recipe is a winner! It’s from delicious. Love to Cook, by Valli Little, the recent 2013 cook book from delicious. magazine. The pavlova is crisp on the outside and has a lovely marshmallow centre. 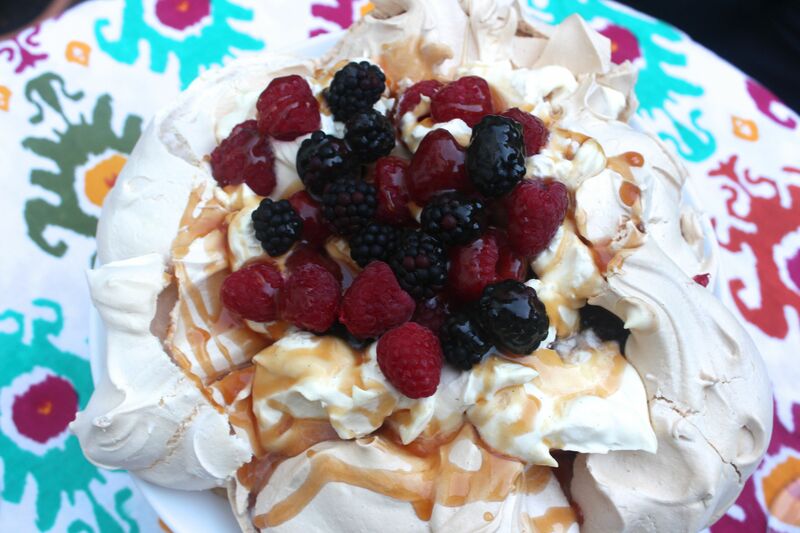 The salted caramel sauce goes very well with the pavlova, and is a sweet contrast to the slightly acidic berries. Thank you to my talented colleague Gez for the title photograph. See http://www.gezxaviermansfielddesign.com/ for more of his photography and designs. 500 gms mixed fresh berries – raspberries, strawberries, blackberries and blueberries work well. Preheat oven to 150 degrees C, non fan-forced. Line a large baking tray with baking paper. Add caster sugar, 1 tablespoon at a time, allowing each to be incorporated before adding the next, whisking until mixture is glossy. Reduce speed to low, then add balsamic vinegar, cornflour and icing sugar, beating to combine. Spread mixture over the baking paper in a round or oblong shape, fairly high, making a slight indent in the centre. Reduce oven to 125-130 degrees C depending on how hot your oven is, and bake pavlova for 1 hour. Turn off oven and leave meringue in the oven, with the door ajar, for 1-2 hours until cooled completely. Remove from oven and place on a serving plate or board. For the salted caramel, combine sugar with 125 mls water in a saucepan over low heat, stirring until sugar dissolves. Increase heat to medium and cook, without stirring, occasionally brushing down the sides of the pan with a damp pastry brush, for 8-10 minutes until a golden caramel forms. Remove from heat and pour in cream – be careful, as mixture will bubble fiercely. Return saucepan to low heat, add salt to taste and cook, stirring, for 1-2 minutes until smooth. To serve – whisk cream to soft peaks, then spread over pavlova. Scatter over berries When ready to serve, drizzle with the salted caramel that has been gently warmed. Posted in Cakes, Dessert, Meringues, Sweet Food and tagged berries, delicious. magazine, Gez Zavier Mansfield Design, pavlova, salted caramel. Bookmark the permalink.